Tharaka pennale...kathiradum mizhiyale ..Jyothish J S bursts into a song while trying his new wheelchair. THIRUVANANTHAPURAM: Tharaka pennale...kathiradum mizhiyale ..Jyothish J S bursts into a song while trying his new wheelchair. He could barely contain his glee. 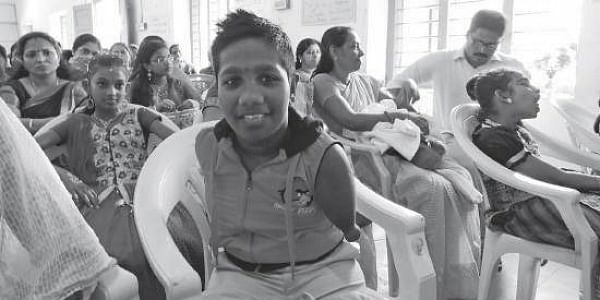 Jyothish, who has a congenital defect which affected his upper and lower limbs causing 90 per cent disability, was gifted with a fully-automated wheelchair on Thursday by We Care, an initiative of Kerala Social Security Mission which addresses the social security needs of the society. “Cases like this which are excluded from other schemes are considered by We Care. We identify the needy and provide them with a livelihood and medical care. We collect money from local self-government bodies and contributions from the public to raise funds,” said Subi Sukumaran, project coordinator, We Care. The wheelchair was manufactured by Bengaluru-based Ostrich. According to the makers, it is fully automated with its controllers imported. The standard design wheelchair costs Rs 1.76 lakh and it has a swing away arm, fingertip movements, angle flexible footrest and a speed of 6 km at his maximum. The fully-charged wheelchair battery can run for 15 km. “It is like a four-wheel drive. This wheelchair has been made particularly for Indian roads. It could run through uneven surfaces with ease and it has the lowest cost terrain technology in India,” claimed Binu J, director, Ostrich. According to Jyothish’s mother, the wheelchair could be a great help for him. “He could go to school and to his tuition centre without our help. Earlier, his father used to carry him,” said Sheeba B, mother of Jyothish. Minister of Health and Social Justice K K Shailaja handed over the wheelchair to Jyothish at her official residence. We Care has identified yet another beneficiary, Rafiya who was diagnosed with Type 1 diabetes at the age of five. She will be given an insulin pump and the same will be handed over by the Minister at the same venue on Friday.